Made for centuries in the Alicante town of the same name, Jijona turrón, with is characteristic golden colour and soft texture, has become one of the most typical Christmas desserts. During its manufacture, Jijona turrón undergoes a chopping process that makes the almond lose part of its oil before going through a softening process in which the mixture is evened out until it achieves the typical golden colour and soft texture that characterize it. Jijona turrón is a food with great energy value, rich in carbohydrates, vegetable fat and protein. 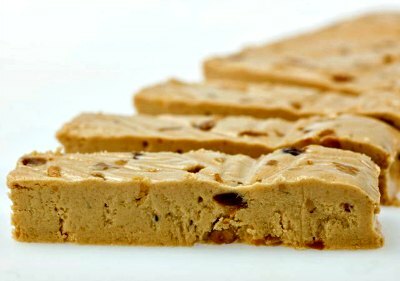 Creamy Almond & Honey Jijona Turron Candy by 1880:Incomparable Marcona almonds make up over 70% of this 'suprema' quality gourmet bar! The almonds are ground together with 100% orange blossom honey for a sweet and delicious treat. Truly the finest in the world! Made by hand in Jijona, Alicante, Spain. 2 Boxes of El Lobo Jijona Turron Candy:Fresh roasted almonds and local honey are blended to create this classic Spanish candy. This rich almond treat can be sliced into bite size pieces and served with tea or coffee. El Lobo brand turron is made by the makers of '1880', one of Spain's finest turron houses. El Lobo products have smaller portions and use less premium ingredients than the '1880' brand, so you can enjoy certified D.O. turron from Jijona at an attractive price. Sugar Free Jijona Turron Candy by 1880:Incomparable Marcona almonds make up 70% of this 'suprema' quality gourmet bar. And you will be amazed that this delicious treat has zero sugar or honey, but tastes almost as good as the original! Truly the finest in the world! Made by hand in Jijona, Alicante, Spain. Highest 'Suprema' Quality.